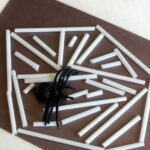 This spider web fine motor activity is so much fun! My son played with it over and over again. 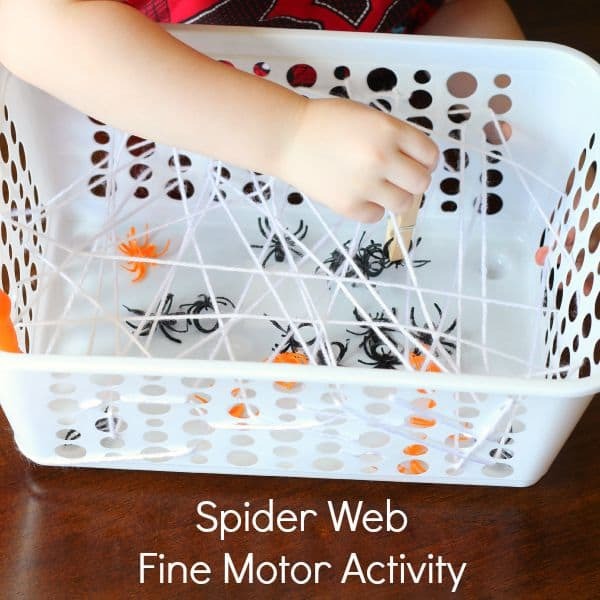 It is an excellent way to develop fine motor skills this fall! 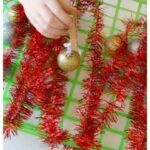 I love activities that are super simple, lots of fun and very effective. 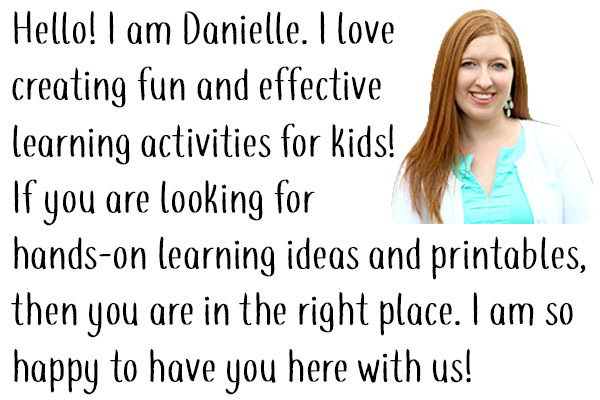 This activity is all of that and more! My preschooler and toddler enjoyed playing with it in various ways. 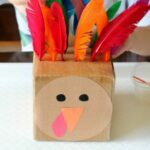 For both kids, it was excellent fine motor practice. 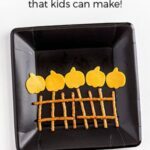 Beyond the learning aspects of this activity, it is simply a super fun game! 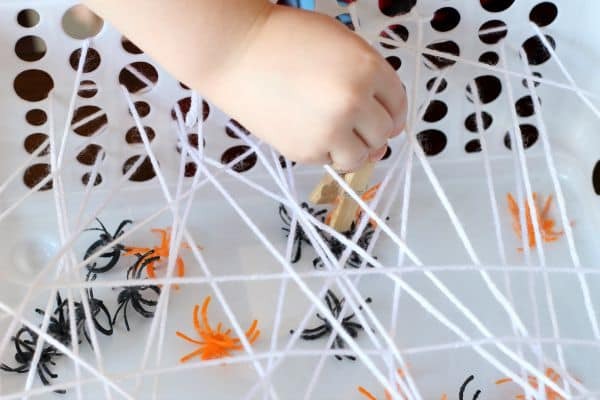 It kind of reminds me of the game Operation because you have to concentrate on keeping the tweezers in between the yarn and pull up gently so that you don’t drop the spider or get it caught on the yarn. 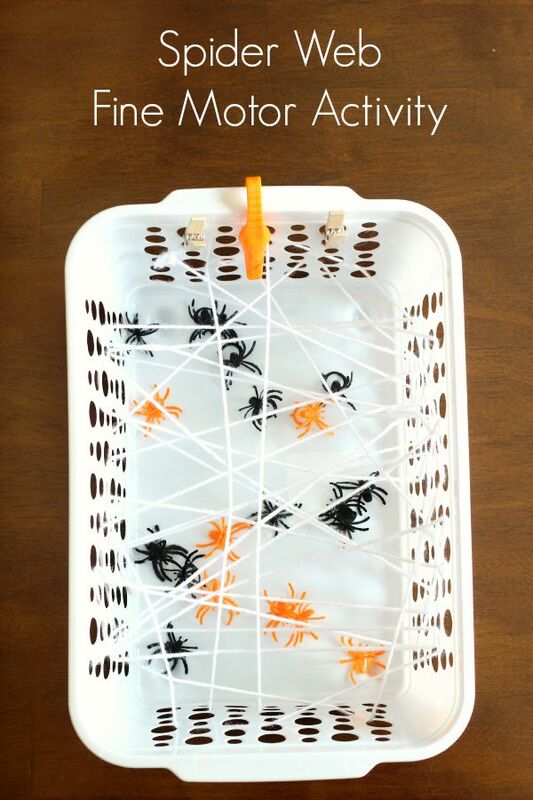 String the yarn back and forth through the holes on the basket. Go in all different directions so that it looks like a spider web. Add the spider rings to the bottom of the basket. I showed Evan how I could use the Gator Grabbers to pick up the spider and carefully remove it from the web. Then I invited him to do the same. He thought this was an awesome idea! Shortly after starting, he realized it wasn’t as easy as he thought it would be. He didn’t get frustrated though. He just got more focused and really concentrated on holding the tweezers together tightly while bringing the spider back up out of the web. 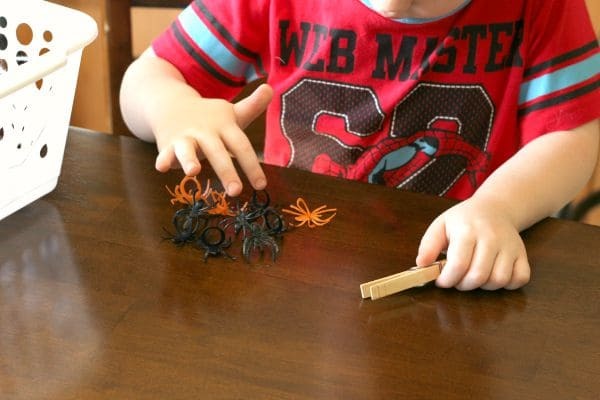 After getting a few spiders his hand became too tired to hold the tweezers together for long periods of time. So he then switched to using a clothespin. This way he only had to clip it on to the spider and pull up. It was still a challenge to maneuver it through the web without getting the spider stuck on the yarn. He even spent some time counting how many spiders he had pulled out. 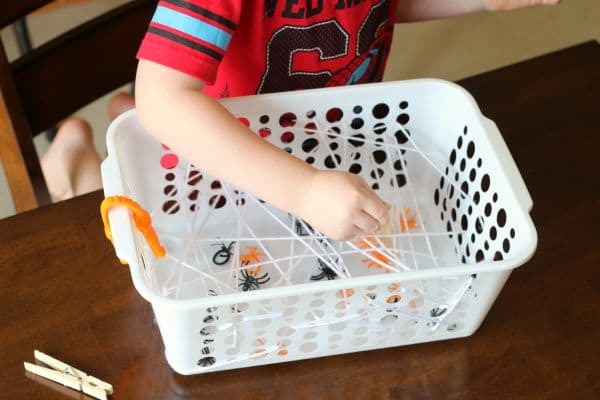 If your child is younger or less developed in their fine motor ability, I would suggest weaving less yarn through the basket. That way there are wider openings to pull the spider through. My toddler even got involved in the activity. She did try the tweezers out, but they were far too difficult for her to use properly. She simply reached her hands in and pulled the spiders out that way. It was still a great fine motor challenge for her as well. This basket has made an appearance several times since in the last week. 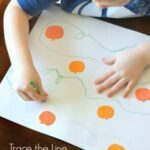 It is a perfect independent busy activity for toddlers and preschoolers! 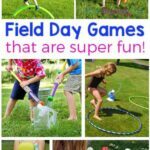 Field Day Games that are Super Fun for Kids!